In Insight, amplitude extraction is implemented as a property of the horizon. There are a few different ways to compute and display an amplitude extraction. The following are steps to perform a single-horizon amplitude extraction. To perform an extraction between two horizons, see Horizon Amplitude Extraction. Tip: To send the resulting amplitude extraction to Petrel, see How do I send the amplitude extraction to Petrel? 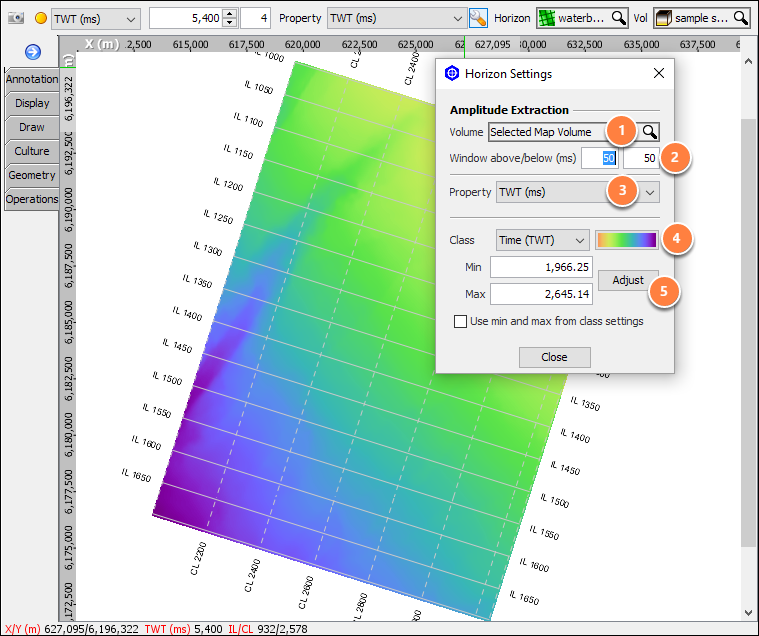 In the Map View navigation bar, select the Horizon which amplitude you want to extract. Click on the spanner icon at Property. This will open the Horizon Settings window. 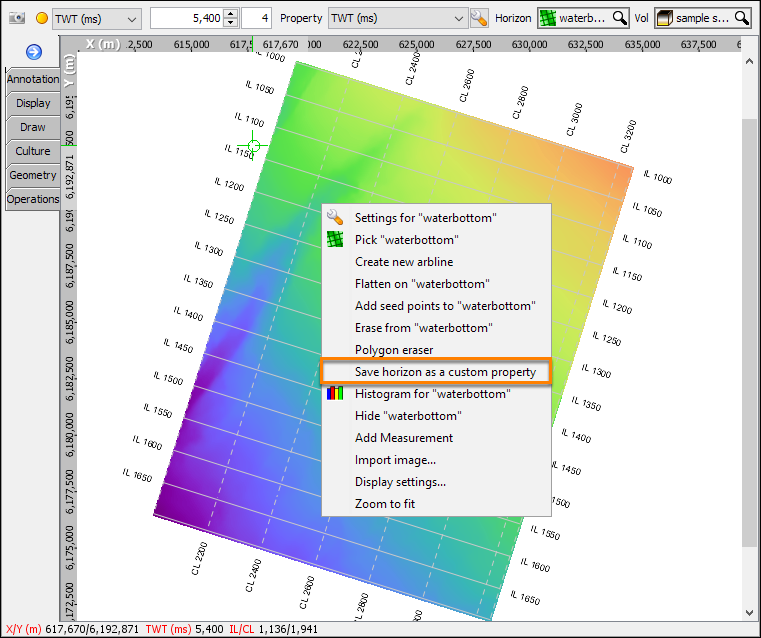 In the Horizon Settings window, select a Volume to extract from. By default, it will extract from the volume you have selected in the Map View. If you choose a property involving a window (i.e. RMS), you can define the amplitude extraction Window (ms) above/below the horizon. For example, 50 ms above means 50 ms shallower than the horizon. 50 ms below means 50 ms deeper than the horizon. 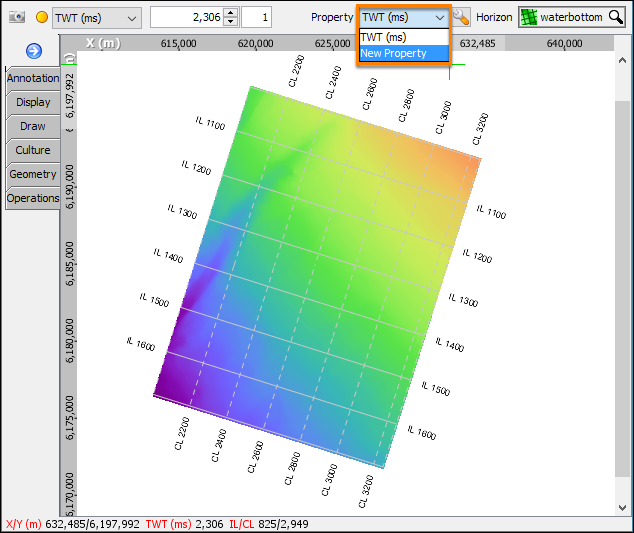 At Property, choose the horizon property to be displayed. This option is tied to the Property in the Map View's navigation bar. 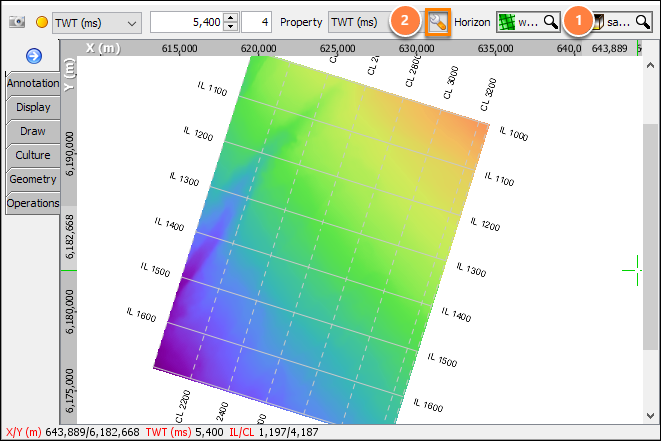 Depending on the property you have selected, different calculation methods will be used to calculate the horizon value (for a definition of the properties, or to create a new property, see Using Horizon Properties). At Class, select the class for the property of the horizon. Click Adjust to automatically adjust the Min and Max clip of the extracted amplitude or select the Use min and max from class settings check box to use the default min and max settings of the class. To save the results of the amplitude extraction, right click on the map in Map View or 3D View, select Save horizon as a custom property. Type a New property name and click OK. The property will be added to a list of properties for that horizon. Note: You can manage all the custom properties for a horizon by right-clicking on the horizon in the Horizon tab and selecting Manage Custom Properties (see Custom Horizon Properties).